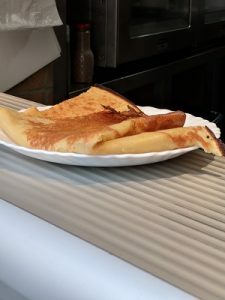 How could I walk around the streets in Nice and not check on the foods! I spotted Serge Serain Chocolatier patisserie shop with a mid morning rush and people standing in line. Ah, the pastries must be good here or they offer strong espresso with a buttery croissant. 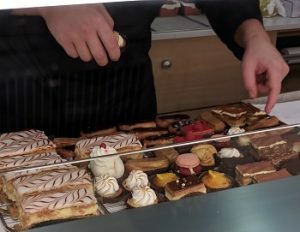 I walked inside and was immediately captivated by the selections of pastries. 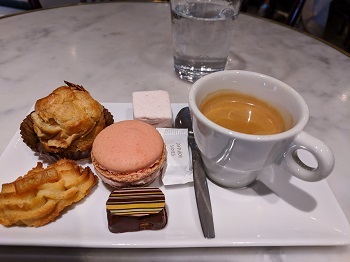 I noticed a little sitting area to the side and narrowed down my choices to the special of an espresso served with small desserts. Although the woman at the counter didn’t speak English, I understood her when she asked me to sit down and the items would be brought to me. I sipped the espresso and watched the interactions with those sitting at tables. They seemed to enjoy their time with one another and then departed giving kisses on the each cheek. 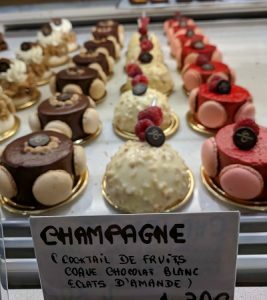 If I ever return back to Nice, I will stay inside longer and eat more desserts! I meandered the streets once again and noticed a very busy corner take away eatery. People lined up for hot crepes and the woman running the restaurant told me the line during the summer is blocks long. An elderly gentleman with a sweet disposition bought a plate of fries and sat at the table. 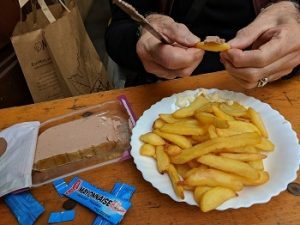 He spread his store bought pate on each fry and offered me one to try! He loved his lunch and was happy to share.